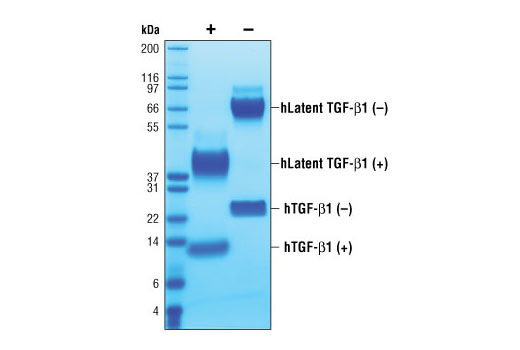 The purity of recombinant hLatent TGF-β1 was determined by SDS-PAGE of 6 µg reduced (+) and non-reduced (-) recombinant hLatent TGF-β1 and staining overnight with Coomassie Blue. The inhibition of IL-4 induced proliferation in HT-2 cells treated with increasing concentrations of hLatent TGF-β1 or acid-activated hLatent TGF-β1 was assessed. 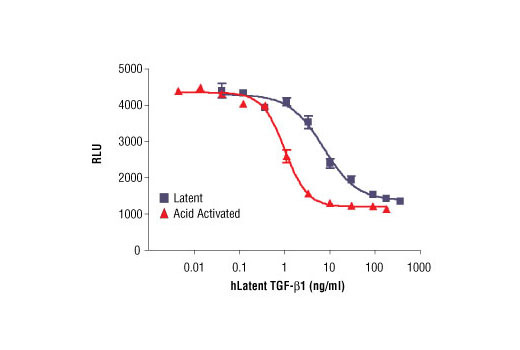 After 48 hour treatment with hLatent TGF-β1, cells were incubated with a chemiluminescent cell viability reagent and the relative light units (RLU) were determined. Western blot analysis of extracts from HeLa cells, untreated or treated with the hLatent TGF-β1 for 25 minutes, using Phospho-Smad2 (Ser465/467) (138D4) Rabbit mAb #3108 (upper) and Smad2 (86F7) Rabbit mAb #3122 (lower). Recombinant human latent TGF-β1 (hLatent TGF-β1) Leu30-Ser390 (Accession #P01137) was expressed in human 293 cells at Cell Signaling Technology. >98% as determined by SDS-PAGE of 6 μg reduced (+) and non-reduced (-) recombinant hLatent TGF-β1. All lots are greater than 98% pure. Recombinant hLatent TGF-β1 contains no "tags" and the nonglycosylated small latent TGF-β1 complex has a calculated MW of 41,251. DTT-reduced protein migrates as 40 and 13 kDa polypeptides, and the non-reduced cystine-linked homodimers migrate as 80 and 25 kDa proteins. The expected amino-terminal ALDTN of recombinant hTGF-β1 and the expected amino-terminal LSTSK of recombinant latency-associated peptide (LAP) were verified by amino acid sequencing. The bioactivity of recombinant hLatent TGF-β1 was determined by assessing inhibition of IL-4 induced HT-2 cell proliferation. The ED50 of each lot is between 0.2- 10 ng/ml after acid activation. Less than 0.01 ng endotoxin/1 μg hLatent TGF-β1. With carrier: A 0.22 μm filtered solution of 0.25 mg/ml hLatent TGF-β1 in PBS, pH 7.2 and 25% (v/v) glycerol containing 20 μg BSA per 1 μg hLatent TGF-β1. Carrier free: A 0.22 μm filtered solution of 0.25 mg/ml hLatent TGF-β1 in PBS, pH 7.2 and 25% (v/v) glycerol. Stable at -20°C for 1 year after receipt. Maintain sterility. Storage at -20°C should be in a manual defrost freezer. Latent TGF-β1 is a complex of two proteins, latency associated protein (LAP) and TGF-β1, which is derived from cleavage of a common 75 kDa precursor protein (1). The LAP protein spatially and temporally regulates TGF-β1 activity by sequestering TGF-β1 in the extracellular matrix in conjunction with latent TGF-β1 binding proteins (LTBP)(1). The release of TGF-β1 is activated by a number of stimuli including proteases, thrombospondin-1, reactive oxygen species, and some integrins (1). Active TGF-β1 binds to TβRII homodimer, which then complexes with TβRI homodimer (2,3). 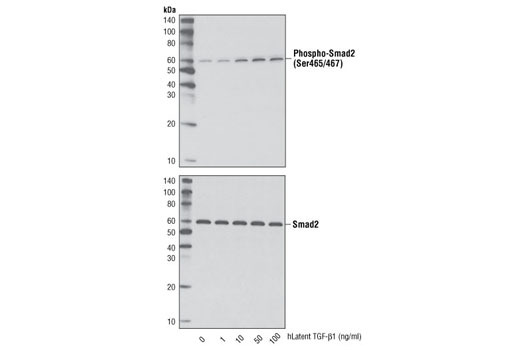 The oligomeric receptor complex phosphorylates subsets of the Smad proteins that then act to induce or repress a number of target genes (3-5). TGF-β1 binding can also activate the Erk2, p38, and Jnk pathways via TAK1 (5). Active TGF-β1 activities include proliferation, angiogenesis, and promotion or inhibition of many immune events (2,4,5). Latent TGF-β1 is present on the surface of regulatory T cells in association with GARP and may contribute directly to their immunosuppressive activity (6,7). Annes, J.P. et al. (2003) J Cell Sci 116, 217-24. Tran, D.Q. et al. (2009) Proc Natl Acad Sci U S A 106, 13445-50. Stockis, J. et al. (2009) Eur J Immunol 39, 3315-22.